Rubio Long Snapper Nick Berus has Committed to UMASS! Rubio Long Snapper Nick Berus (PA, ’13) has committed to UMASS as a preferred walk-on! Nick came out to Vegas for the 11th Annual National Snapping Event and made it deep into the finals. 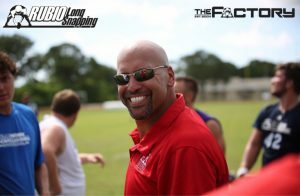 He is a very solid Long Snapper that is athletic and very coachable. He handles pressure well and I wish him the best of luck. Rubio Long Snapper Emmett Odegard commits to UMASS! Long time Rubio Long Snapper Emmett Odegard (CT, 13) has committed to UMASS as a preferred walk-on! Emmett, who was just noted in a previous blog, is a terrific Long Snapper and person. He has been with Rubio Long Snapping since 2010, made the TOP 12 last year and can easily go down as one of the hardest workers to improve the most over time. He is a true student of Long Snapping and was dominant at the 11th Annual National Kicking and Snapping Event in Las Vegas a month ago. He made it to the finals and only lost by about one inch. I am extremely impressed with and proud of Emmett! UMASS got a great one! For more information on Rubio Long Snapping, go HERE.